An Extraordinary Escape from the Ordinary. The resort's 85 unique Hotel rooms offer a variety of amenities such as Indoor or Outdoor Spas, Suites, Wood Burning Fireplaces, and Private Patios with splendid views of the majestic Superstition Mountains. Carved out of the foothills of the scenic Superstition Mountains, the 36 holes of Desert Mountain Golf at Gold Canyon offer two distinct playing options. Dinosaur Mountain, rated 4.5 stars by Golf Digest takes golfers into the high Sonoran Desert with dramatic tee-to-green elevation changes. Sidewinder, Four Star Rating by Golf Digest, runs through the land's natural arroyos and dry creek beds, providing a pristine desert golf experience. Amenities include Hiking, Biking, Swimming Pool, Jeep Tours, Massage and Spa Services and much more! Enjoy spectacular views while Dining at Kokopelli's Restaurant, The Bar & Grill or The Ledge at Dinosaur Mountain. Over 10,000 feet of Distinct Full Service Meeting and Banquet facilities for functions ranging from 10-200. 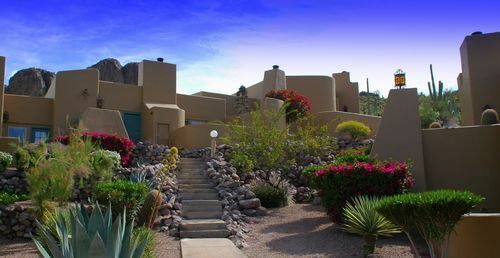 Located just 35 minutes from Phoenix Sky Harbor International Airport, this very special mountainside resort is close enough to the Valley of the Sun, yet far enough away to let you experience the peace and unmatched beauty of the high Sonoran Desert. Come and enjoy a true Arizona Golf Resort experience. minutes away is the nightlife of Phoenix and Scottsdale, or the peaceful serenity of Canyon Lake. ~7 miles from Gold Canyon. ~30 miles from Gold Canyon. ~37 miles from Gold Canyon. ~42 miles from Gold Canyon.